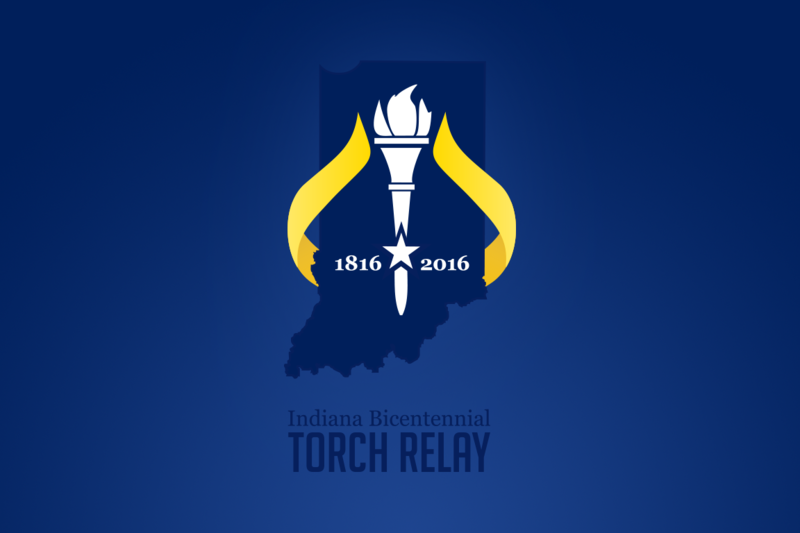 On September 11, the torch will travel through Posey County from 12:00 PM to 2:30 PM. Before heading on towards Gibson County, the torch will pass by the historic town of New Harmony, Indiana. Located near the Wabash River just about 25 miles north of Evansville, New Harmony functions as an ideal destination to slip away from modern distractions. Harmonie State Park is just a few miles south of the historic city. Within the park, patrons have the option of camping on their own, or they can rent one of the various cabins offered on site. I remember the cabin my own family rented out when I was very young. Electrical luxuries made the stay feel more like glamour camping, “glamping,” than camping, especially when we played video games on my father’s XBox 360. However, the walks along the easy-going hiking trails and visits to the nearby nature center within the park helped us reconnect with nature. 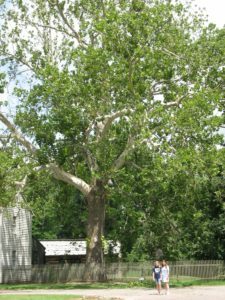 The town of New Harmony is an interesting blend of historical buildings, preserved for the public’s enjoyment that stand alongside modern day establishments that fuel the life within the community. As a young girl, the old, log cabins did not interest me. Nor was I interested in hearing about the history concerning the two notable groups who settled in New Harmony, the Harmonists and the Owenites, who each attempted to build their own version of Utopia in southern Indiana during the 1800s. What I did find to be engaging were the labyrinths. The Harmonists’ incredible work ethic coincides with their religious philosophy; that the journey to find paradise was difficult, but that the journey itself could inspire revelations along the way. The labyrinths used by the Harmony Society, as demonstrated in their sketches, were used as a tangible means to demonstrate this spiritual journey towards enlightenment. Certainly, as my sister and I raced around the zig-zagged pattern on the ground, we were not concerned with spiritual matters. 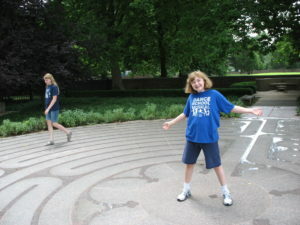 Years later, when I re-visited New Harmony with my Girl Scout troop, we were also all more interested in the destination of reaching the center of the labyrinths than the meditative journey toward the center. Since the original labyrinths of the Harmonists were constructed out of different types of vines and shrubs and other organic materials, their original structures have not survived the test of time. 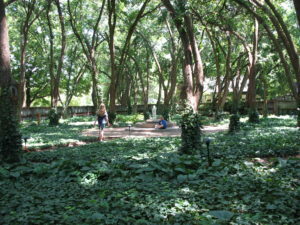 The hedge maze labyrinth was reconstructed in 1939, and was based off of designs created by the Harmony Society that had been stored in the Harmony Society archives (1). 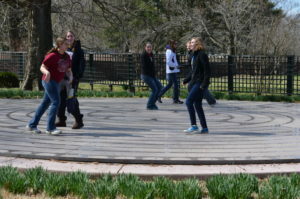 Today, the labyrinth remains the most iconic symbol of New Harmony. Especially during their time, the Harmonists’ most symbolic structure was a marvel in the American frontier (2). Apart from their internationally-famous work ethic and religious structures, what made Rapp and his community stand out in tourists’ minds was the fact the fact that they did not proselytize, or try to convert, any new members once settled in America (2). In fact, new membership into the society was discouraged (1). Truly, the ambition of the Harmonists was to create a thriving community upon which all members worked well together towards a shared goal of preparing for Christ’s arrival. The Harmonists eventually sold their land to Robert Owen in 1825, who would later make his own distinguished mark on the town by conducting a communitarian experiment (3). Owen’s goal was to create a Utopian society upon which all citizens were equal and had access to free education. Again, though the Harmonists had moved their community back to Pennsylvania and erected a third settlement in Economy, their labyrinths continued to influence the spiritual mentality of the new group of settlers whose goals were not unlike their own. The influence of the labyrinths and the various groups that made New Harmony a hallmark of societies has not gone unnoticed in modern times. New Harmony’s Atheneum, opened in 1979, is one part museum and one part theatre that plays films devoted to relating the history of New Harmony. 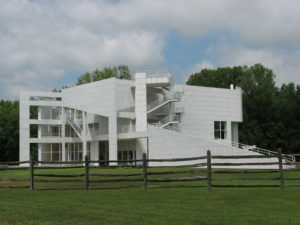 Most tourists visit the award-winning building in order to broaden their knowledge and enhance their visit during their stay in New Harmony. Whether they are just passing through, or have made New Harmony a destination for a weekend retreat, it is hard to not take time to reflect upon the natural beauty of the town. Though I spent much of my time in the town racing my sister or my friends throughout the labyrinths, in retrospect I think I really did appreciate and enjoy the homely atmosphere created by the town and the surrounding natural wildlife. Click here to see a full list of events taking place in New Harmony this year.